If your shoulder is painful with certain motions or when you sleep, your rotator cuff could be giving you trouble. You need the strength of your rotator cuff to help you do all sorts of activities from brushing your hair and teeth, to lifting objects overhead and even throwing a baseball. The rotator cuff is the group of four muscles that surround your shoulder joint, guiding the way your shoulder moves. When the rotator cuff is weak or injured, poor shoulder movement occurs, causing inflammation and pain. 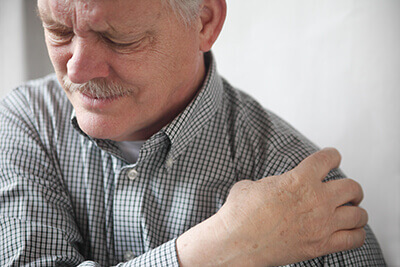 An injured rotator cuff is often the result of repetitive or forceful movements of the shoulder and is one of the most common upper body injuries throughout any age. In fact, rotator cuff tears become a normal finding as people get older. Studies show that 30% of those under the age of 70, and 70% of those over age 80 have a rotator cuff tear. There is hope for relieving shoulder pain and it comes with proper motion and strengthening of the shoulder. The goal of treating a rotator cuff tear is not necessarily to heal the torn muscle or tendon. People can achieve pain relief and improve strength simply by relieving inflammation and restoring normal shoulder joint movement. This is accomplished with the right physical therapy and anti-inflammatory treatments, including medications, cortisone injections and ice applications. Rest and ice frequently. Ice for 10 minutes right on the shoulder joint, even if it aches in your mid arm area. Sleep hugging a pillow. This helps to properly space the shoulder joint. Tuck the pillow deep in your underarm. Stand up against a wall and gently squeeze your shoulder blades back and together. Don’t shrug your shoulders. This helps retrain proper shoulder posture. Avoid heavy lifting, carrying groceries on that side and repetitive reaching up overhead, even if it is a light object such as a cup. If your pain doesn’t go away in 3-4 days, seek help from our physical therapists. The goal of physical therapy is to improve the function of the muscles that surround the shoulder and to help the mobility of the joint. Physical therapy targets the smaller, but important muscles around the shoulder that are commonly neglected. By strengthening these muscles, physical therapy helps compensate for damaged tendons and improves the mechanics of the shoulder joint. Our physical therapists perform gentle hands on therapy to restore proper shoulder motion and educate you on important techniques and exercises. They greatly accelerate shoulder pain relief pain and restore proper motion for long-term results. The truth is that the vast majority of people who have a rotator cuff tear will not need surgical treatment and can be helped tremendously with physical therapy. Call us today to learn more about our shoulder program and how we can help relieve your pain!